Thomas Theodor Heine (28 February 1867–26 January 1948) was a German painter and illustrator. Born in Leipzig, Heine established himself as a gifted caricaturist at an early age, which led to him studying art at the Kunstakademie Düsseldorf and, briefly, at the Academy of Fine Arts in Munich. In 1896 he became successful as an illustrator for the satirical Munich magazine Simplicissimus, for which he appropriated the stylistic idiom of Jugendstil and the graphicqualities of Henri de Toulouse-Lautrec, Aubrey Beardsley and Japanese woodcuts. The illustrated critiques of social orders, and the monarchy in particular, that he made for the magazine led to a six-month prison sentence in 1898. 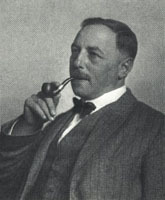 He also began work as a book illustrator in the 1890s. He fled Germany in 1933, first to Prague. From 1938 until 1942 he lived in Oslo, and from 1942 until his death in 1948 he lived in Stockholm. He published a highly cynical autobiography in 1942 Ich warte auf Wunder (English: I Wait for Miracles).